The staff was friendly and helpfull and also breakfast was good. The price, the staff that was more than great providing us assistance, and helped us changing 3 rooms - and compensated us with fruits. Hotel was clean. Close location to downtown. Staff was friendly and helpful. Nothing. The price on booking was 313 lv, on spot I paid 360lv without breakfast. Very clean room. Comfortable and enormous double bed. Very good breakfast incl. in price. Holiday Inn Thessaloniki This rating is a reflection of how the property compares to the industry standard when it comes to price, facilities and services available. It's based on a self-evaluation by the property. Use this rating to help choose your stay! Located in the center of Thessaloniki, only 1,650 feet from the central train station, Holiday Inn Thessaloniki features 5 fully equipped meeting rooms, an air-conditioned mini gym. Holiday Inn Thessaloniki is 0.6 mi from the port and Thessaloniki’s bustling streets and local attractions. Holiday Inn Thessaloniki is 9.9 mi from Makedonia International Airport. 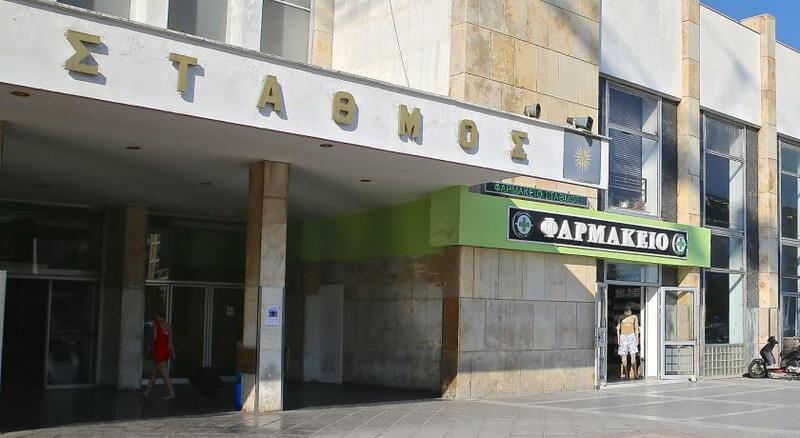 The Ioannis Vellidis Congress Center is 1.2 mi from Holiday Inn. When would you like to stay at Holiday Inn Thessaloniki? 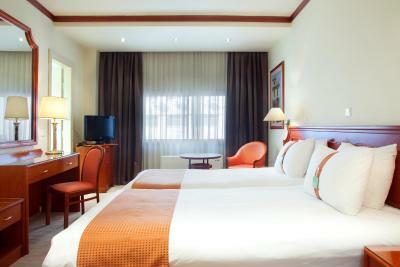 Comfortably furnished room with climate control, pillow menu, and blackout curtains. 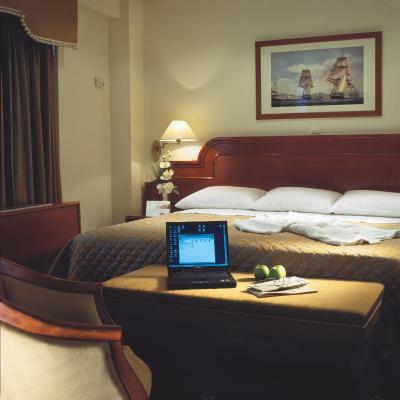 Each room has a work desk with lamp high-speed Internet access, electronic safe and flat-screen cable TV with 16 channels. The junior suite offers the comfort of extra space. It includes a living area and modern bathroom with a set of bathrobes. Pay TV, a sofa bed and pillow menu are featured. 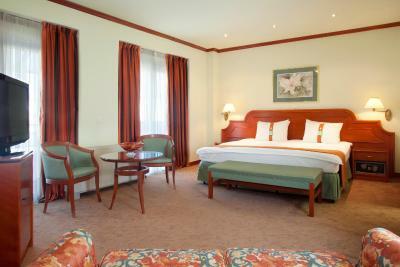 Elegantly furnished with well-chosen furnishings and soft colors, this air-conditioned room features carpeted floor. It includes a mini-bar, satellite TV and a laptop safe box. 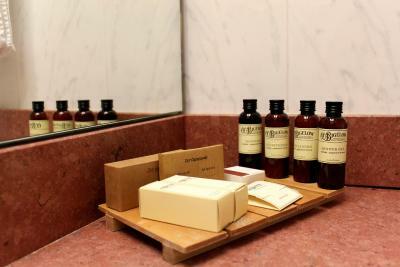 Private bathroom is stocked with hairdryer and free toiletries. Standard rooms come with high-speed internet access, mini-bar, safe, satellite TV, Pay TV and air conditioning. A bathtub, hairdryer and magnifying mirror are featured in the bathroom. Please note that bed type and smoking preference cannot be guaranteed and will be allocated based on availability. This suite features a sofa, CD player and tea/coffee maker. This double room has a mini-bar, satellite TV and soundproofing. House Rules Holiday Inn Thessaloniki takes special requests – add in the next step! Holiday Inn Thessaloniki accepts these cards and reserves the right to temporarily hold an amount prior to arrival. Kindly note that pets up to 4 kg are allowed on request and free of charge. Mainly hotel staff and price. Very bad!! This isn't 4 stars hotel ,maybe 2 ? ?.Not clean,very dirty,old furniture,the stuff was rude,the breakfast dirty and nothing that we can eat,dirty the place were was eating,I wonder how it was in the kitchen?? ?First time and the last time I am sleeping here!! Very expensive for what they are given!!! As a warning, if you have a car DON'T park it on the side street from the hotel, had mine broken into and stuff stolen. Park in the hotel car park (10€ per day) or the cheaper car parks nearby. -just the surrounding roadworks which is not of course of the Hotel's responsibility. -parking space underground, just behind the hotel is the entrance but needs attention on your way in, too steep entrance may harm the car below. GYM is realy small and not suficient to do an exercises. Very good breakfest and good localization. Noise is the. Biggest killer. All night traffic on the road - need better sound insulation. The area the hotel was in. It was like a slum. Felt unsafe. Tatty. Dirty. Rubbish everywhere along with graffiti on every surface. The hotel room was an ark back to 1970. The fixtures an fittings were worn, broke, tatty and mucky. The bathroom had a yellowing toilet seat, pealing paint, broken shower hook, a drain in the floor full of smelly black mould. Cleaning was not done well. The view from the window, room 701 was of a pile of scrap and rubbish on the floor. Breakfast was poor with poor quality produce. Poor quality juice on a morning, more like paint stripper. The hotel was noisy, with no sound proofing. Slamming doors, and Greeks feeling the need to shout down the corridor at 5 am slamming the doors as they go. I will never return. Shower over bath was cramped. No outside seating that we were aware of. Hotel is outdated and should be soon renovated. Furniture and bathroom are usurated , they do need renovation. Room climatisation is too loud for sleeping. 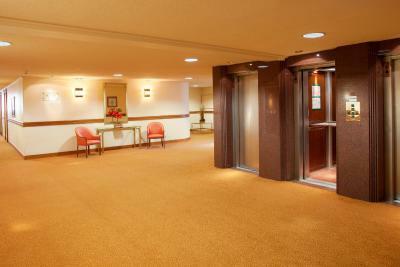 Hotel personal is experienced and offers help in any request. Position is close to main shopping and business area. Hotel lobby looks nice and tidy.